I’ve never had a bacon sarnie in my life, and the only sausage sandwiches I’ve had have been this year and involved veggie ones. As you may have gathered, I’m not struck on recreating pig products (or any other meat, for that matter) with vegetarian alternatives. But I admit to having been intrigued by the following recipe, which I found years ago when the Metro newspaper started up and used to have a rinky-dinky recipe column based on the premise of quick meals for that night’s dinner. And yes, it’s a vegetarian version of a BLT sandwich – not one you can wrap up and take to work, unless you like cold halloumi, but one you can dress up for lunch or supper with some potato wedges and dips on the side. The first time I had halloumi was when I made this sandwich. It bemused me a bit at first when it squeaked between my teeth and didn’t melt, but it grew on me, particularly when I discovered how much a lemon dressing pepped it up (courtesy of a Turkish restaurant in Norwich) and how I tolerated it much better than cow’s milk cheese. Heat the ciabatta through in the oven while you’re dry-frying the halloumi. When the bread is warm, slice it in half and grill it lightly on both sides. 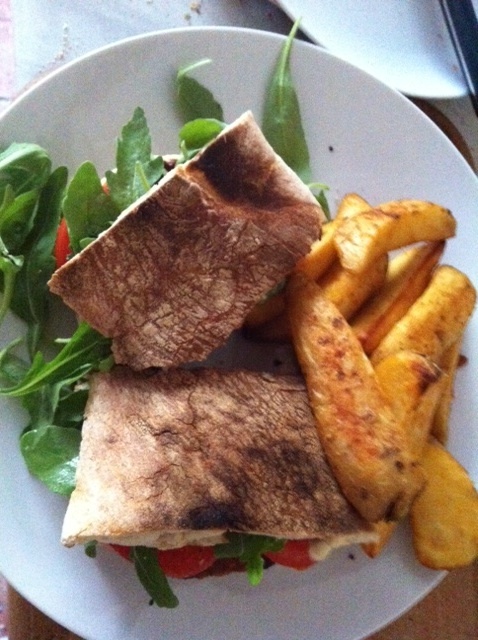 Spread hummus on the flat sides and then pile on the halloumi slices, followed by the tomato, topped by the rocket. Drizzle lemon juice over, and add salt and pepper if you like. If you’re hungry, add potato wedges on the side, with salsa or guacamole to dip them in. I don’t know about you, but I rarely think about cooking something to go in a sandwich. Sandwiches are, for me, something that is made from cold ingredients and leftovers. But I was inspired by finding out there was such a thing as a Chicago Pepper and Egg Sandwich. It sounded unlikely coming from one of the big meat-packing cities of the USA, but apparently it is a thing. Problem was, when I came to make it, I didn’t have any eggs to hand. But I didn’t let that stop me. This is a nice, juicy sandwich filling. 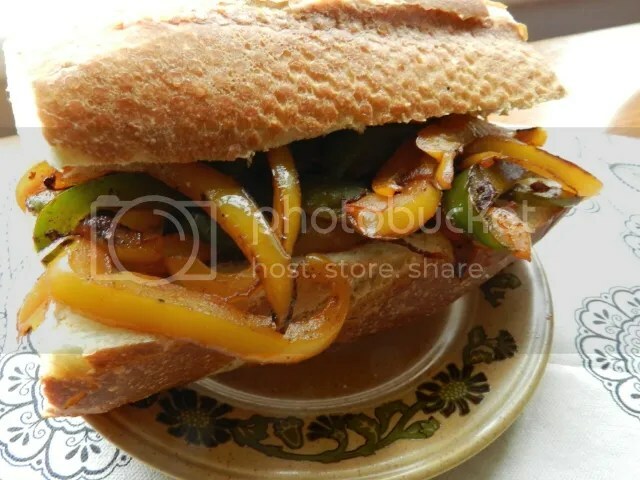 If you wanted to make it more substantial you could spread some hummus on the bread before adding the fried peppers. Heat some oil in a frying pan and add the peppers and onion. Cook gently on a low to medium heat until the peppers are softened and slightly blackened. Add the garlic and the smoked paprika and cook through for another five minutes. Serve on a split baguette with a squirt of lemon juice over the top. For the past year, banh mi (the Vietnamese sandwich) have been everywhere. I don’t think there’s been a newspaper or food magazine that hasn’t covered them so far. I had kind of pushed them aside in my mind as ‘just another food fad’, and anyway, all of the recipes I saw had meat in them. Then I saw a couple of recipes for ones with tofu and decided to give it a try. These are full-flavoured, chin dripping, fun, dirty street-food. Believe the hype – these are great. 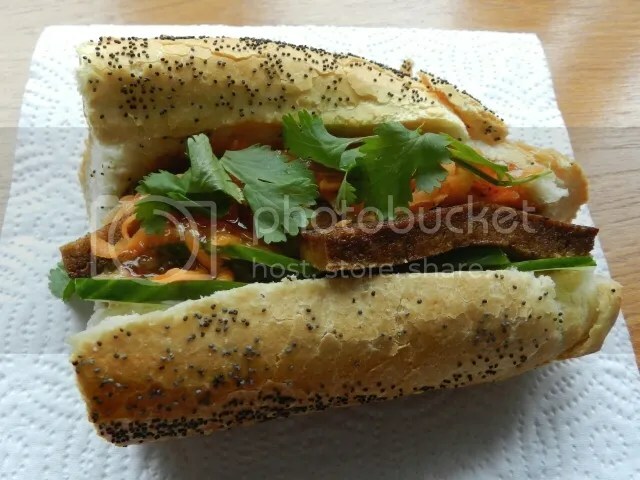 Your basic banh mi recipe is a length of french bread, sliced as for a sandwich, some mayonnaise, a pickle, chilli and a protein source. (As an aside, I have found a vegan mayonnaise by Tiger Tiger in Sainsbury’s and it’s excellent.) I went with carrot pickle and fried tofu in a teriyaki-ish sauce. Note that the photo is on kitchen paper. This is deliberate. You will probably need to mop up afterwards. I needed to change my t-shirt. Put the carrot, vinegar and sugar in a bowl. Fry the tofu in it until it is browned on both sides. Add the rice wine, soy and sugar. Mix gently so that the tofu is coated in the sauce. Let it bubble down until it is almost dry. Layer up the cucumber, tofu, pickled carrots and the rest of the ingredients, topping with a drizzle of chilli sauce. Serves 2 Make sure you have plenty of napkins or kitchen roll to mop up as you eat. The only thing standing between me and veganism for the past few years has been butter on my toast in the mornings, and small amounts of cheese. The latter has finally got the chop; the former will stay, if only because I detest the alternative spreads with a fiery vengeance. So I’m in the market for non-cheese fillings and toppings. Avocado’s a pretty spiffing sarnie filling, and if you mash it up, you don’t need butter with it. But it always needs something there to perk it up a bit, hence why those supermarket sandwiches with it in are so bland. So play around with a base for it. My work colleague Emma suggests Marmite. I’ve used soft goats’ cheese in the past. 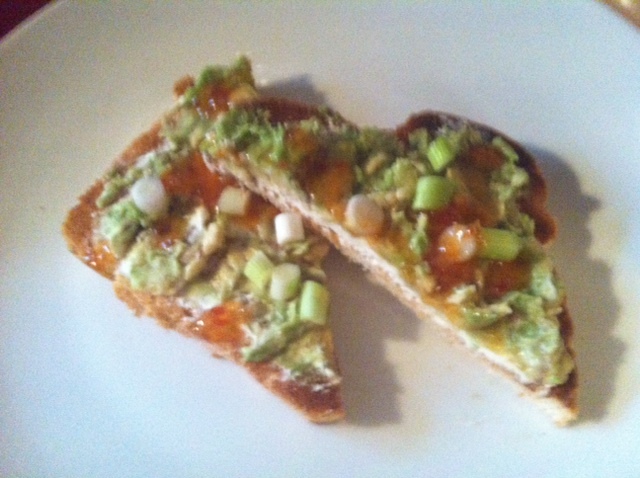 Both of these work well, as the sharpness/saltiness contrast nicely with the creamy avocado. You could stop there but I like it with finely-chopped spring onions and a drizzle of sweet chilli dipping sauce on. I did try red onion once when I was out of spring onions, but the slices need to be thinner than thin things or it over-powers the flavour. And this cries out as well for decent chunky bread. I think it’s better toasted – and you could rub a peeled garlic clove across as well. I’ve tried it with bagels and it’s good, but a thick-cut slice off a white farmhouse or bloomer loaf wins by a whisker. Toast the slice of bread and spread with the base of your choice. Mash or thinly slice the avocado, depending on how soft it is, and pile on the bread. Sprinkle thinly-chopped spring onion on top, then drizzle over some sweet chilli dipping sauce. Loads of food cultures have a variation of cheese and bread heated together. We have the cheese toastie. In Mexico they have the quesadilla, using corn or flour tortillas. 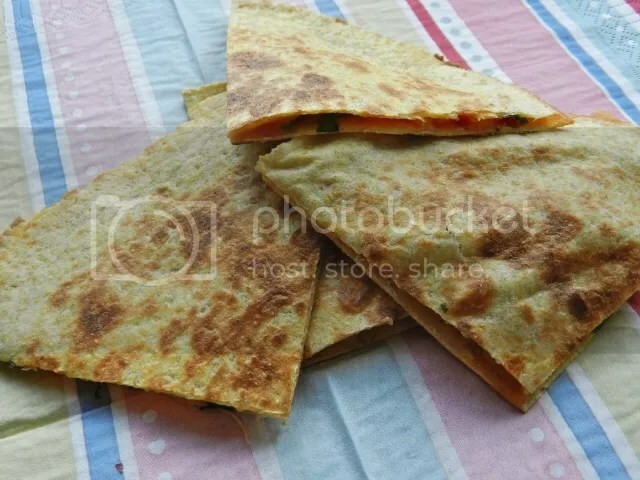 There are two variations, the quesadilla where one tortilla is filled and folded in half and the sincronizada where the filling is sandwiched between two tortillas. In both cases the tortilla is dry fried (or fried) on a frying pan or griddle. You’ll tend to find sincronizadas called quesadillas if you see them in restaurants and having started writing this blog entry I think that’s because quesadilla is easier to spell. They’re a great and easy snack/lunch to make. Once you have the technique down pat, then there are a wide variety of versions you can make. I’ve listed some ideas at the bottom. In my experiments with this I’ve found flour tortillas slightly easier to handle, although the corn ones have more flavour. I would also warn people to keep the filling fairly frugal to be sure that it cooks through properly and to make it easier to eat. I’ve done two recipes in this entry, a cheese based one and a vegan option. To be authentic for the vegan one, I should be using refried beans, which you can find in some supermarkets now, but in fairly large tins. As I’m giving the recipe for two people, I’m going to use baked beans. If anyone wants to report me to the Mexican Embassy over this, their number is 020 7499 8586. Add the filling ingredients to a bowl and mix well. If you’re doing the baked beans version, try and mush the beans together a little as you mix. Put a small frying pan on a medium to high heat. When it’s hot add the first tortilla and spread half the filling over it. Heat until the bottom of the tortilla is looking a little browned and crispy. Cover the lower tortilla and filling with a second tortilla and press down. Using a fish slice or a spatula, carefully turn the tortilla sandwich over. Heat the tortilla until it is now toasted. Remove from the pan and cut into quarters. Serves 2 as a light lunch or snack. Once you have mastered this technique then the variations are only limited by imagination and taste. Off the top of my head you could try tapenade and mozzarella; hummus and chopped green olives; mozzarella, tomato and basil; crumbled falafel and tapenade. You could even try a sweet version with peanut butter and grated chocolate or Nutella. Cheese on toast was never this good.